Darci Faye, a recent graduate of the University of Maine at Presque Isle and director/founder of Broadway Kids in The County, is hosting an exciting opportunity for Aroostook County children who are aspiring playwrights and theater enthusiasts. 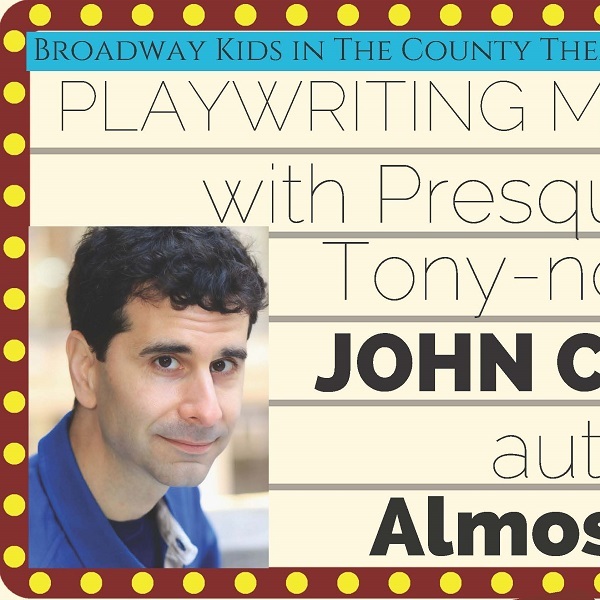 Presque Isle native and acclaimed playwright John Cariani will teach a Playwriting Masterclass on Sunday, June 25, at the Aroostook Centre Mall in Presque Isle, in the former FYE store space. Broadway Kids in The County invites children to come to one of three sessions: 3-4 p.m. for ages 11 to 13, 4-5 p.m. for ages 14 to 18 and 5-6 p.m. for ages 19 and up. The workshop is designed to help aspiring playwrights and screenwriters keep the “play” part of words “playwright” and “screenplay” in mind as they write. Cariani will lead participants through various exercises that can get them started on a play or a screenplay. Broadway Kids in The County is a new theater company for children ages 18 and under. Faye started the company to address the lack of theater opportunities that exist in many areas of Aroostook County. Cariani’s Playwriting Masterclass is part of several programs that Faye hopes to continue. Broadway Kids will also host several children’s musicals in the coming months including its summer camp production “Giants in the Sky” in July and “Christmas Kookies” in December. “Theater is something that not all County kids get to do in school, so we want to fill this gap. When learning a musical our actors will learn how to read music, dance and act but they will also gain self-confidence that will stay with them throughout their lives,” Faye said. Cariani graduated from Presque Isle High School in 1987. After earning his Bachelor’s degree in history from Amherst College, he studied theater at StageWest in Springfield, Mass., and moved to New York City to pursue a career in acting. He made his Broadway debut in the 2004 revival of Fiddler on the Roof and received an Outer Critics Circle Award and a Tony Award nomination for his portrayal of Motel the Tailor. He originated the role of Nigel Bottom in the recent Broadway hit Something Rotten! and received an Outer Critics Circle Award nomination for his performance. On television, he is best known for his roles on NBC’s Law and Order (as Forensics Tech Beck), on CBS’ Numbers (as Professor Otto Bahnoff) and on IFC The Onion News Network (as reporter Michael Falk). Notable film work includes Showtime (with Robert De Niro), Scotland, PA (with Christopher Walken) and Elephant Sighs (with Ed Asner). He will be starring in the Broadway show The Band’s Visit alongside Tony Shalhoub this fall. Cariani is the playwright of Almost, Maine, cul-de-sac, LOVE/SICK and Last Gas, which was recently performed by the Presque Isle Community Players at UMPI for its hometown premiere. His first play, Almost, Maine, has become one of the most frequently produced plays in North America, produced by more than 3,000 theater companies across the continent. The play is currently the most frequently produced play in North American high schools, topping perennial favorites A Midsummer Night’s Dream, You Can’t Take It With You, and Our Town. There is no charge for the Playwriting Masterclass, but donations will be accepted at the door. To RSVP, please contact Faye at broadwaykidsac@gmail.com. For more information about Broadway Kids in The County, visit the website http://broadwaykidsac.weebly.com/ or Facebook page https://www.facebook.com/CountyKidsTheatreCo/.